11 :: Gerrards Cross Golf Club is considered one of the most attractive courses in South Buckinghamshire. Kindly sponsored by GV Multi -Media. 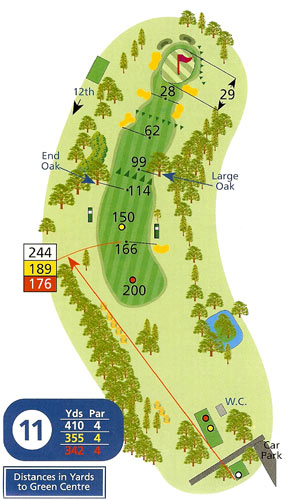 This hole dog-legs right and requires an accurately positioned drive if a second shot over the tall trees on the right is to be avoided. Catching the fairway bunker on the right will remove any chance of reaching the green in two. The sloping approach to the green is heavily bunkered on left and right sides. A par four is a good result.